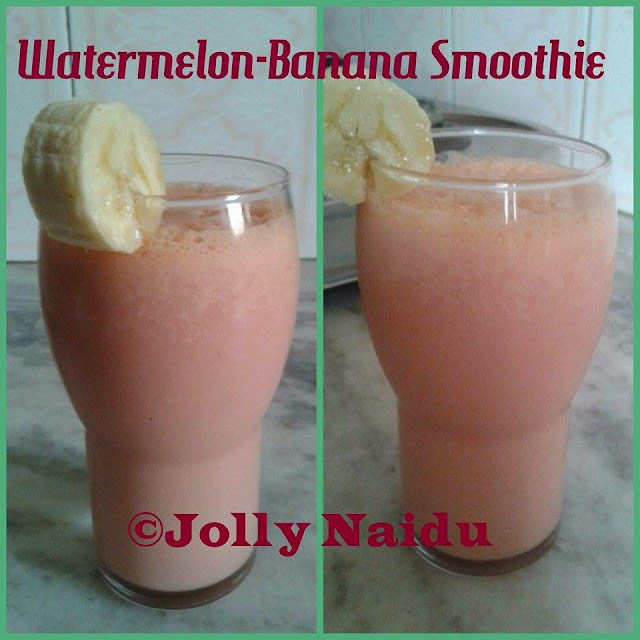 Today made this yummy Watermelon-Banana Smoothie recipe at home. A healthy drink made out of watermelon and banana which can energize you and provide you with iron and vitamins. This is great smoothie for kids also. This can be a wonderful smoothie to have anytime and any season. This delicious drink made with very less ingredients. This is best meal for breakfast. Let's begin the step by step process of yummy watermelon banana smoothie recipe. 1. For preparing watermelon-banana smoothie, add sliced watermelon, banana and sugar into blender with little bit water. Blend until smooth texture. Now, add lemon juice and mix well. 2. Add chilled milk, ice cubes and again blend into a fine smoothie. 3. Your cool smoothie is ready. Serve chilled and garnish with watermelon or banana slice. You can add finely chopped watermelon slices or banana slices in a smoothie. definitely in our future! with soymilk 'cause we're vegan, but yummy anyhow!